Here’s where they get written. 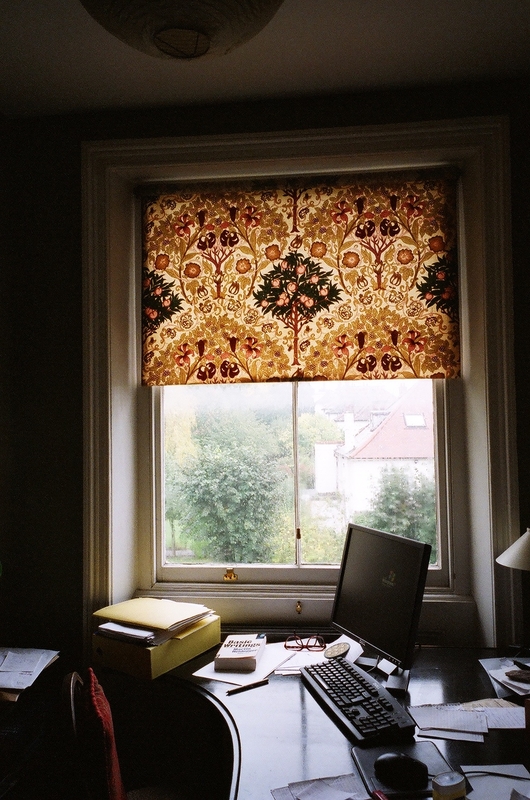 The William Morris blind has been with me since I wrote my first book after returning from a year in Russia. 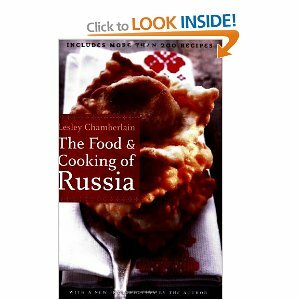 The Food and Cooking of Russia first appeared in a gorgeous hardback edition with Allen Lane in 1982. The (then) picture editor Susan Rose-Smith and I spent days researching nineteenth-century illustrations. 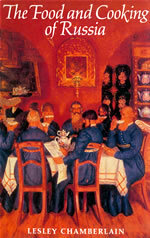 The cover shows a painting by the artist Boris Kustodiev. I worked on this book while reporting the news from Moscow. At the height of the Cold War, 1979, Western journalists had to live in designated blocks away from the Russian population. My trips to the Lenin Library and to Moscow’s Food Museum were ways of making contact with ‘ordinary’ Russians. I cooked every recipe and used my experience of the country in that stunning year to portray their everyday life – something that was hardly imaginable for those who thought of it – I ‘m jumping a couple of years ahead now – as ‘the evil empire’. Here’s the latest (2006) edition, available from Amazon. At least the text is the same, with a new preface explaining more about how I came to write the book. 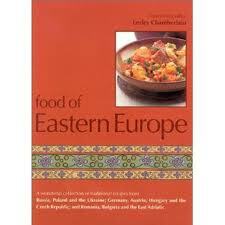 A second cookbook followed in 1989, The Food and Cooking of Eastern Europe. It followed the same format, and, besides good recipes, you’ll find a lot of material from my travelling across what was then the whole of the Communist ‘East’ Bloc. I was in Albania, Yugoslavia, Czechoslovakia, East Germany, Hungary, Poland, Romania and Bulgaria. 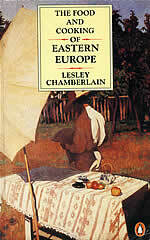 The cover painting is by Karoly Ferenzy, from the National Gallery in Budapest. The revolutions of 1989 did away with the collective East Bloc and restored these diverse countries to sovereignty. There’s an introductory section for each nation while the recipes are arranged as a cook would want them: starters, soups, meat, fish and so on. Find the 2006 edition, again with a new preface, on Amazon. 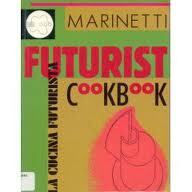 I struck out into new territory with my edition of Filippo Tomasso Marinetti’s Futurist Cookbook, which also appeared in 1989. Marinetti, who was a poet and a master publicist, also alas an enthusiastic follower of Mussolini, followed his earlier ground breaking Futurist Manifesto of 1909 with a late venture into food in 1932. The Italian original is a very dull experience compared with the stunning edition publisher Conway Lloyd-Morgan and designer Liz McQuiston put together, with a translation by Suzanne Brill edited and with an introduction by me. Getting to understand what Marinetti, who worked with the painter Fillia and other artists, was doing with food was a treat and a revelation. As I made the recipes I kept notes on the colours and shapes and volumes that appeared. The experience was much closer to making art than cooking. You can eat some of the recipes, but that always seems to me the wrong approach. Part of this hybrid book is given over to food scenarios which always seemed to me like short screenplays. Three quarters of a century before the celebrated avant garde chefs of the 1990s like Fernan Adria and Heston Blumenthal, Marinetti experimented with themed food and food that played with the diner’s expectations. He suggested scenarios in which to stage it as well as to eat it. Hip modern eating owes him a great deal. This book has been out-of-print for some years now, but Penguin are promising a new edition in July 2013. See my website for reviews, details of other editions, and other occasional food books.